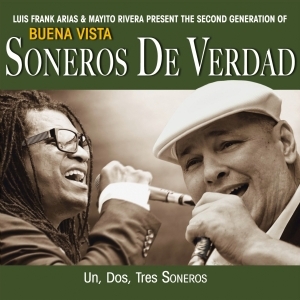 LUIS FRANK ARIAS (leader and singer of the band) himself calls Soneros de Verdad “the second generation of the Buena Vista Social Club”. He was making a clear statement: that the band (which includes the legendary Pio Leyva as one of its founding members) remains faithful to traditional son cubano, albeit in its own very special way: because in addition to some Cuban classics, Soneros de Verdad also present a wealth of new songs – in “ancient costume” so to speak. In order for this mixture of old and new to work perfectly, Luis Frank took another gifted star of the Latin scene on board to join his six-man elite band: no less a singer than MAYITO RIVERA. Previously, Rivera had been the front man and the face of legendary LOS VAN VAN for twenty years. With this wealth of musical experience and the accumulated dexterity of its musicians, the combo Soneros de Verdad succeeds in delighting audiences all over the world. SONEROS DE VERDAD (The Singers of Truth) is a band with two exceptional vocalists who are hard to beat. Luis Frank, a master of son cubano, alongside Mayito Rivera, with his outstanding timba vocals, both bewitch the audience with their fiery stage presence. Soneros De Verdad are a MUST for every true lover of good Cuban music!